This was our first intercity bus ride in Iran and I must say that it was a very pleasant one. The bus used was a Scania, and reminiscent of the buses I took in New Zealand several months before. At US$6, it was definitely a steal. They even gave us snacks and juice onboard. We left Shiraz at 8 in the morning, and by 2 in the afternoon we were dropped off at Yazd’s bus terminal. We then took a taxi to Kohan Kashaneh Hotel which was again recommended by Antoine. We arrived without having made any prior reservation, which was just great. We were quoted a room price of under US$30 per night including breakfast. 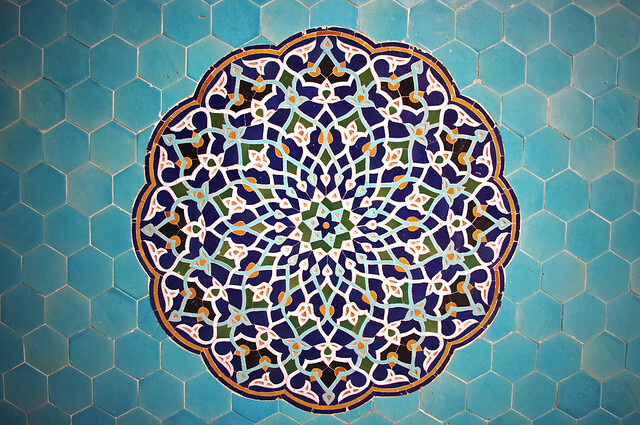 The hotel itself is situated near some of the sights in Yazd but is hidden within its maze-like streets. 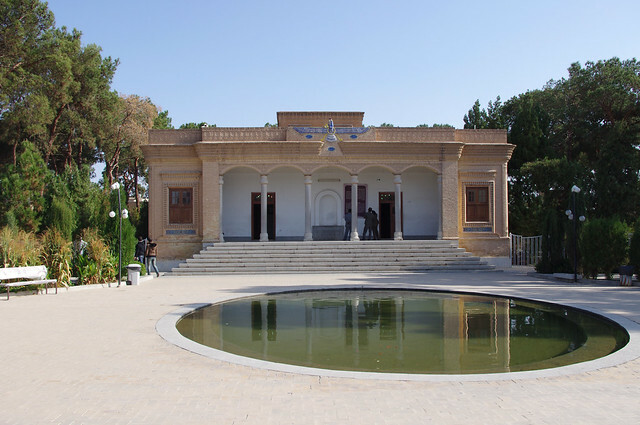 It is set in a historic house with a classic Persian courtyard / garden in the middle and an underground well. 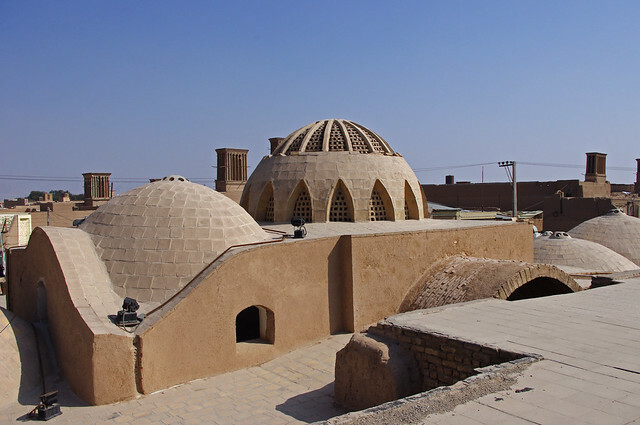 my hotel in yazd – kohan kashane — highly recommended! As the sky was very gloomy that day, we decided to just spend the rest of the afternoon walking around the old city. Compared to Shiraz, it was quite compact and the locals here looked much more conservative as well. Most women were wearing the black full-body cloth, although even at that extent, none of them had their faces covered like in the Arabian countries. We walked up to iconic Amir Chakmaq near the main commercial area of the old city. A guy with a good command of English approached us – I was to learn later he was a refugee from Afghanistan. Hanging around Amir Chakmaq frequently to meet tourists and practice his English, the guy has met tourists from many countries but was quick to admit that I was the first from the Philippines. We chatted for quite a bit. He complained about how Afghans were marginalized in modern Iranian society, doing the jobs which the locals are unwilling to do. He also shared with me his desire to be an English teacher in Korea or elsewhere in the Far East. But what really surprised me was his wide knowledge of the outside world – including things which I thought the government would have censored. IIt soon turned dark – he meant to invite me to his family home around 10 kilometers from the city, but as I wanted to stay in Yazd the whole time, I declined and went back to my hotel. The following day, we started our proper tour of the city. We started by going to the Zoroastrian Fire Temple which was located at the edge of the old city. 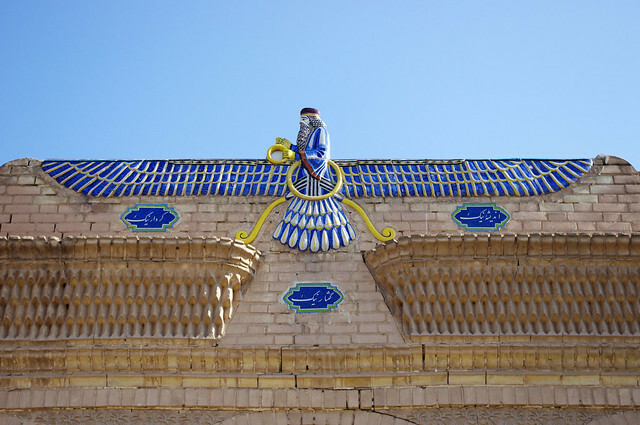 Zoroastrianism is one of the world’s oldest religions and is based on the teachings of Zoroaster. It used to be the state religion of Persia during the Pre-Islamic period. today it has a few thousand followers left. A Zoroastrian who was at the temple grounds approached me. I tried to ask him how Zoroastrians today are treated in modern Iranian society. He remained coy and refused to answer me directly. What I do know is that officially, Zoroastrianism is one of the officially recognized minority religions by the Iranian government and as such, they are allocated one seat in parliament. But things may not be black and white. Not wanting to discuss these things with me, I decided to leave the guy and make a move. I then proceeded to Dolatabad Gardens. Although I had been to 3 gardens in Shiraz, I decided to check this one out due to the UNESCO World Heritage designation. Going in, I found the grounds to be less impressive than those I saw in Shiraz. The summer pavilion however, is quite unique. It has a very tall wind tower used for ventilation that can be seen from most parts of the city. Octagonal-shaped, the pavilion is flanked by stained-glass windows and a symmetrical pattern on its ceiling. This was my introduction to the many other impressive, symmetrical ceilings/domes that I would witness later on in the trip. After seeing Dolatabad, I was pretty much satisfied with Yazd and decided to just walk around town for the rest of the day. Yazd is a very easy place to get “lost” in, due to the same clay-colored buildings inside the old city as well as the unmarked maze-like streets so my objective for the rest of the day was just to get lost. However, it did not take long to get a good overall sense of the place. 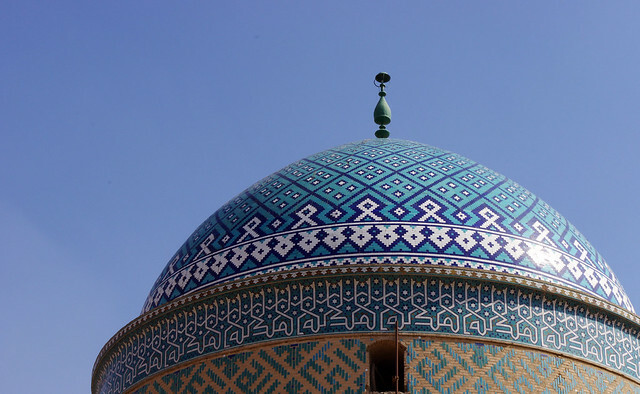 There were many picturesque landmarks to observe – including the Masjid Jameh (Friday Mosque), the dome of the Rokamdin mosque as well as the tall clock tower. Another trademark of the city is that it has so many historic houses that are converted as hotels, so no matter where one ends up going, it would be inevitable to come across one of these lodgings along the way. Many of them are also worth a visit and have stunning courtyards. In some cases, the hotel staff would be happy to give a tour of their hotel for free. I watched the sunset from the Hosseinieh, the only high building that I could climb up to. 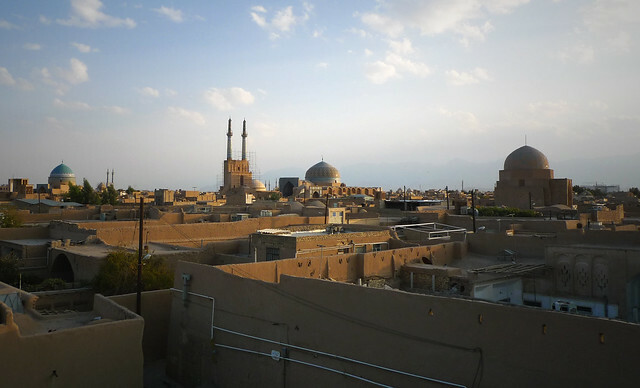 From above, it was easy to appreciate the unique city skyline consisting of water reservoirs and wind towers competing for attention with the islamic minarets, which are unique to Iranian desert cities like Yazd due to the harsh weather conditions. That evening, I capped my tour of Yazd by visiting the Zurkaneh or the traditional Persian gym (translated as: house of strength). Though modern fitness centers are common nowadays in Iran, the Zurkaneh is the traditional exercise facility for the men of this country. The exercise activities are like performances – the men gather in a circle and conduct their synchronized exercises to the tune of a leader on a stage with drums who chants Persian epics. This adds an en-trancing touch to the entire spectacle – this Persian style exercise which historically was used to train warriors for battle. It sounds really mundane that I capped my visit to Yazd by going to a fitness center. But I suppose this also came to symbolize what I thought of the city. It takes everyday, mundane things and adds a unique touch to them due to the harsh geographical location – from the clay material of most buildings that creates the great desert city atmosphere to how water is stored to sources for ventilation during the hot summer months. 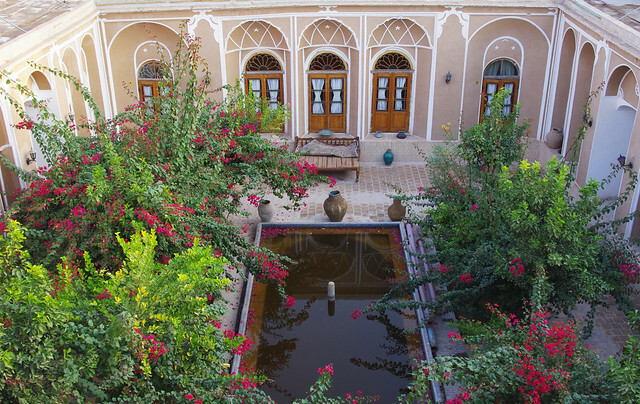 Yazd is exotic to a T.
Malek o Tojjar – the most decorative hotel in Yazd, hands down! Orient Hotel – nice place to have a rooftop view over Yazd. Jameh Masjid and other nearby attractions are close by. 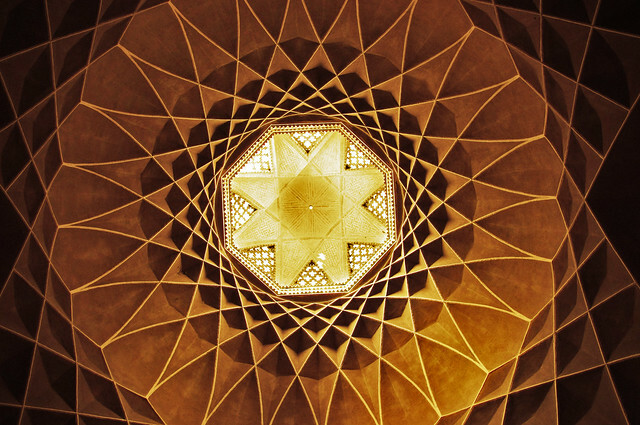 I was in Yazd for five days last year – it’s such a beautiful city. If you have the chance, you should try to get out to Kharanaq, a lovely old and abandoned mudbrick citadel where one little old woman still lives. It’s wonderful! Love the photos. Thanks for the recommendations. 5 days! Wow, Yazd is really a fantastic city. wow! Pictures palang parang fantasy na. ganda! Iran is really one destination that I highly recommend. It is not at all the country which most people think it is. It is cheap too. excellent post i never knew Iran was so beautiful. It was very nice to read. 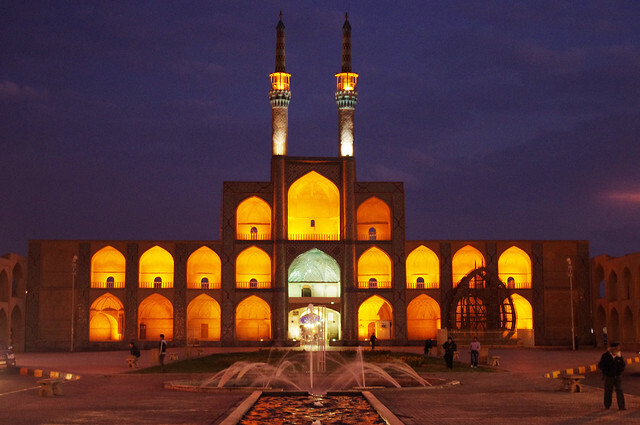 In fact it is a new knowledge for me – Yazd. Thank you for writing about that. And the photos are also great, they really convey the feels of the place. Well done ! Love ly post and pictures, especially that of the dome.